Caption this photo in the comments section. The winners will be posted on Monday, March 25th. Posted on March 22, 2019 March 20, 2019 by WyattPosted in Caption ContestTagged Elizabeth Warren, Logan Airport. Let’s all go on the warpath! 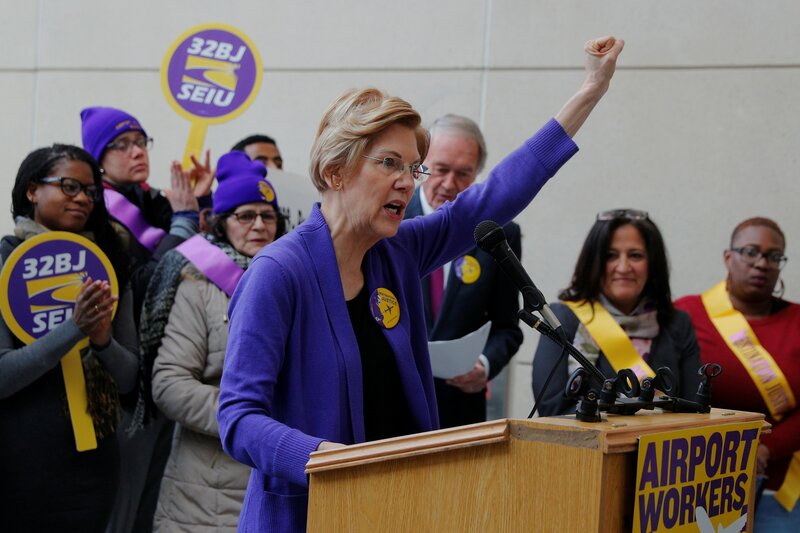 Having been exposed as not being Native American, Elizabeth Warren regales the Airport Workers Union with the tale of how she raised the “Black Power” salute at the 1968 Olympics. I tried to slit my wrist, but it healed. See? All we hear is Radio GaGa, Radio GooGoo. Senator Elizabeth Warren raises her Invisible Tomahawk while stumping during her Invisible Campaign. J-dub got mine. A few other good ones this week.